USDJPY; has more legs to go…………. After, Yellen’s comments last Friday at Jackson Hole and the subsequent correction in the majors against the USD, I feel levels are now more reasonable reflecting the relative economic health of the countries. However, I believe, the GBP and JPY have more downside adjustment to be made. Take a look at the 4H USDJPY, the JPY is now just under the 38.2% level, I believe there is more room for the JPY to weaken. Since last Friday, the back of my neck was feeling itchy and I couldn’t thinking that the USD was oversold after the FOMC. 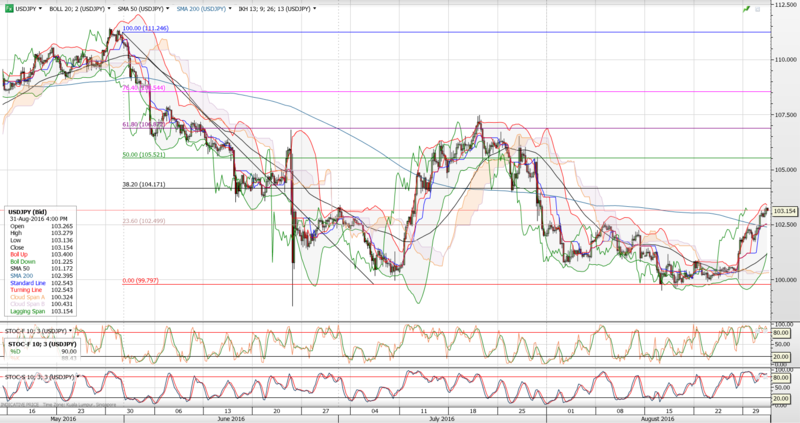 From a technical point of view, isn’t a USD reversal a high probability??? Janet Yellen’s speech and Q&A did not warrant such a strong sell down in the USD, this is my personal opinion. I am looking at buying put options against the majors till maybe end of April, will have to check the premiums to ascertain whether it’s expensive or not.